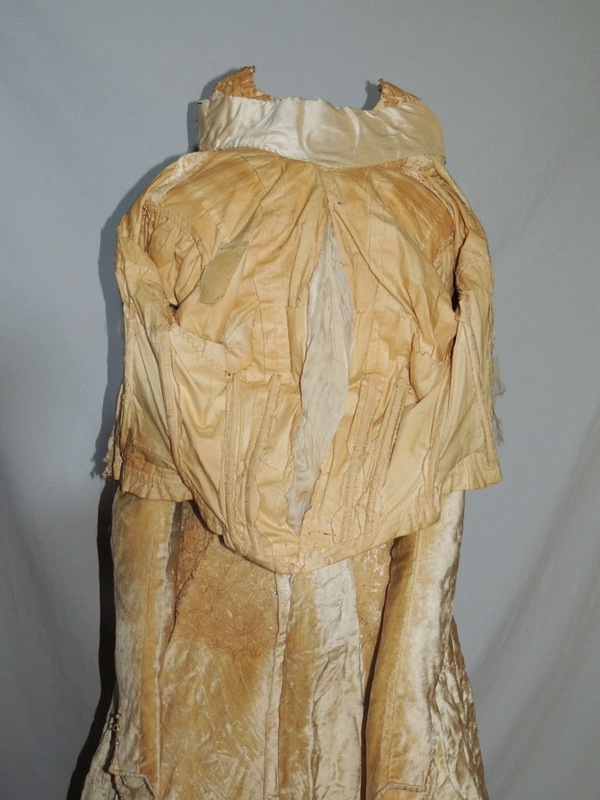 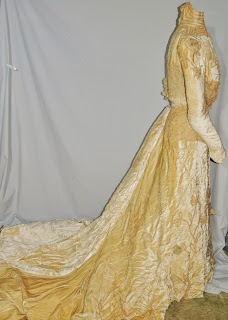 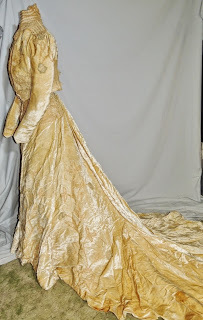 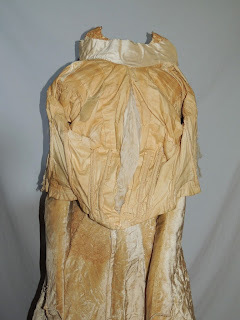 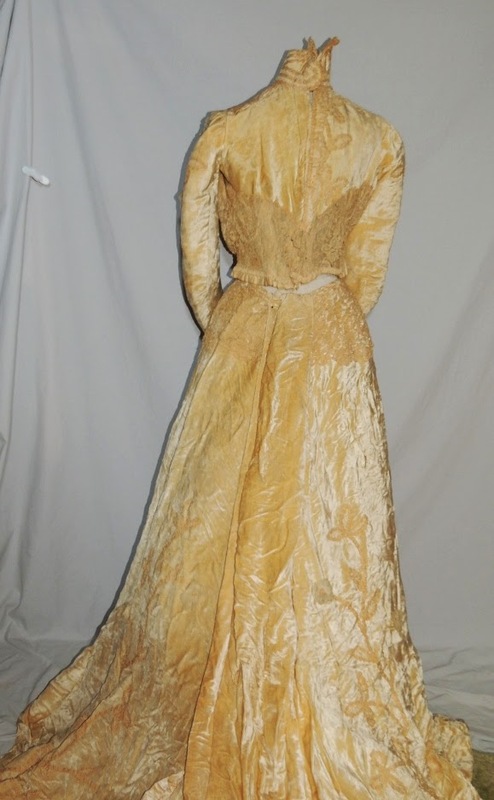 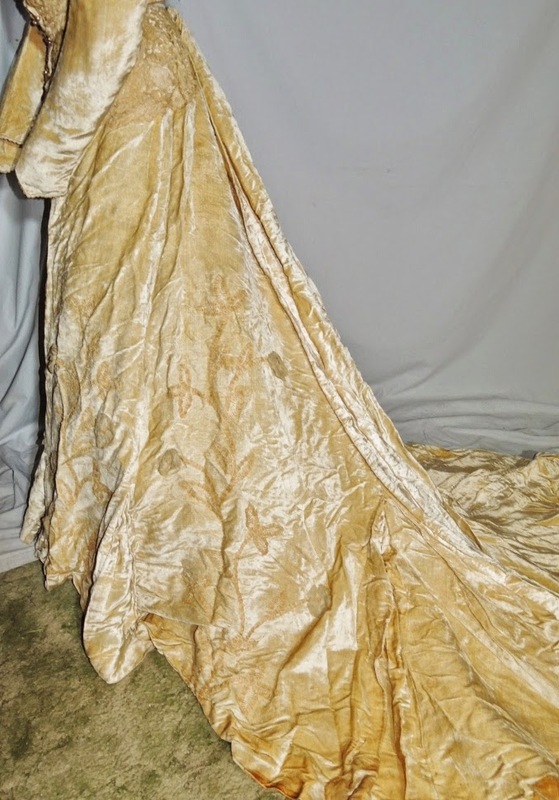 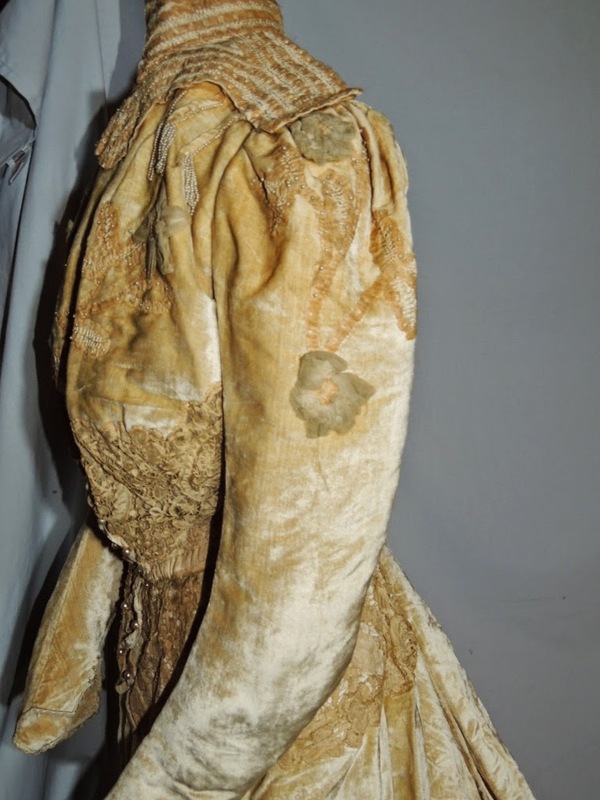 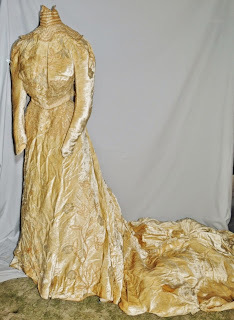 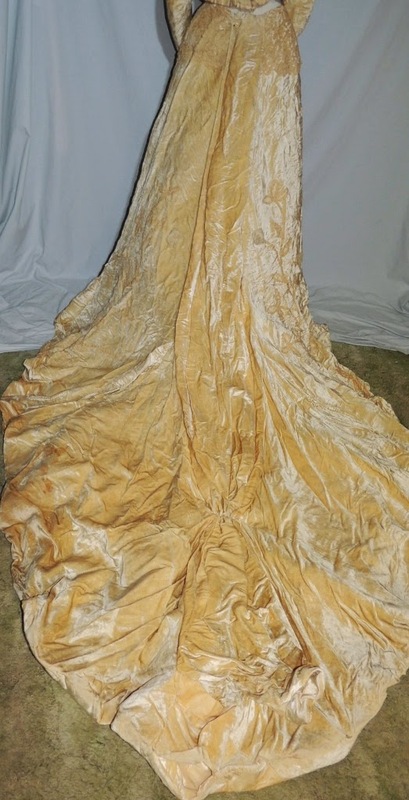 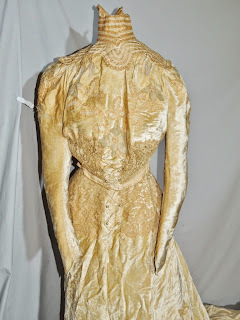 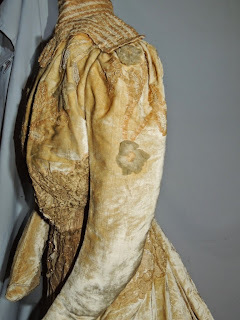 This lovely 1890's gown is made from ivory silk and cream silk velvet. 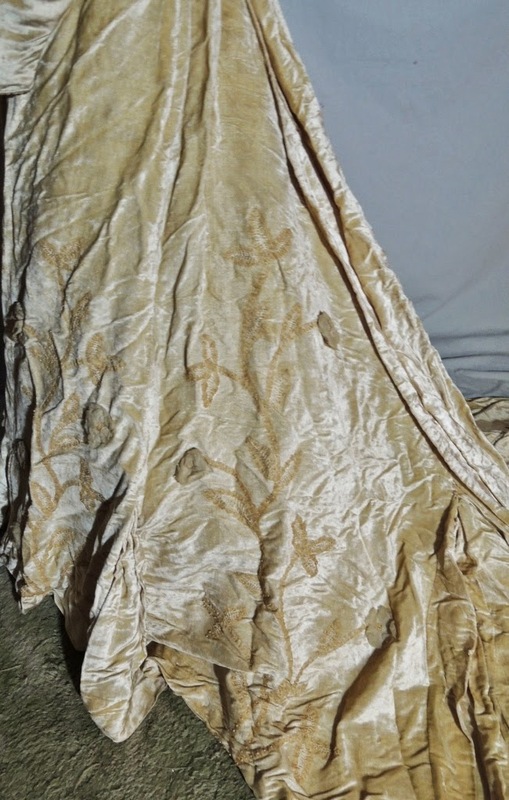 The skirt has vines of braid with silk chiffon flowers appliqued to it. 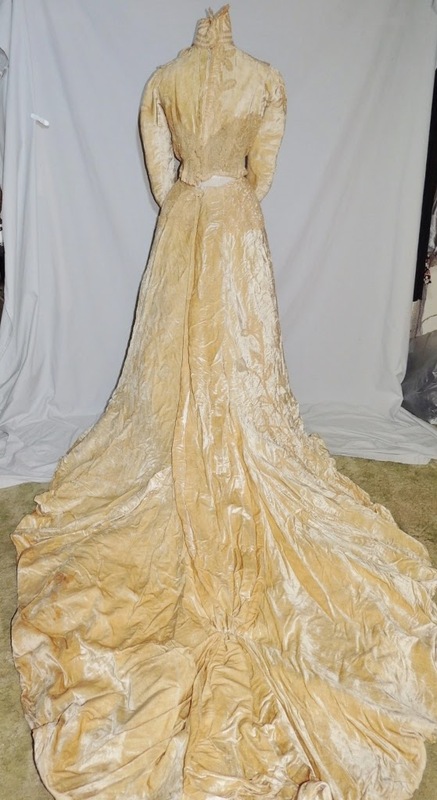 IT has Brussels? 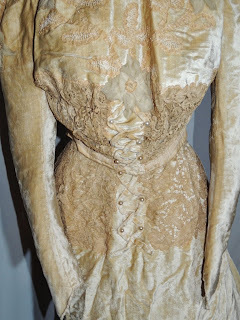 Lace around the upper hips, and a narrow back in center rnt with large pearl buttons. 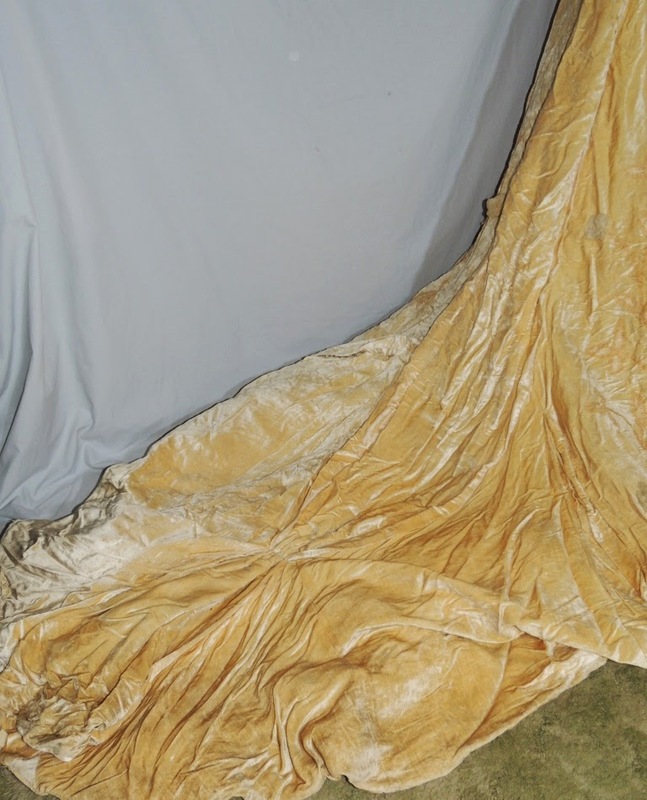 The huge train has boning across it, and around the bottom edge to make a perfect curve. 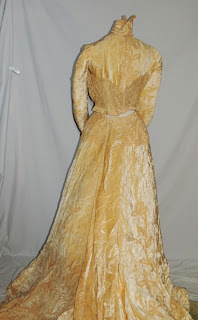 It's lined in tan cotton. 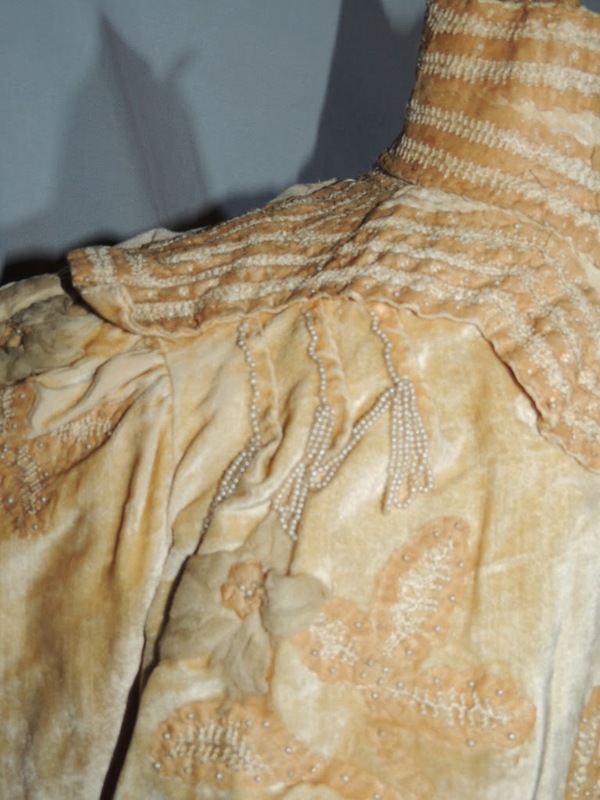 The brading has small pearls dotted along it and there's faggoting between the braid to fill in the leaves. IT has some worn spots in the velvet, the worst spot is on the back edge of the train, the velvet there is splitting and there's a stain on the side. The bodice has the lace, silk flowers and vines, with pearls, there's pearls over the shoulders with looped fringe. 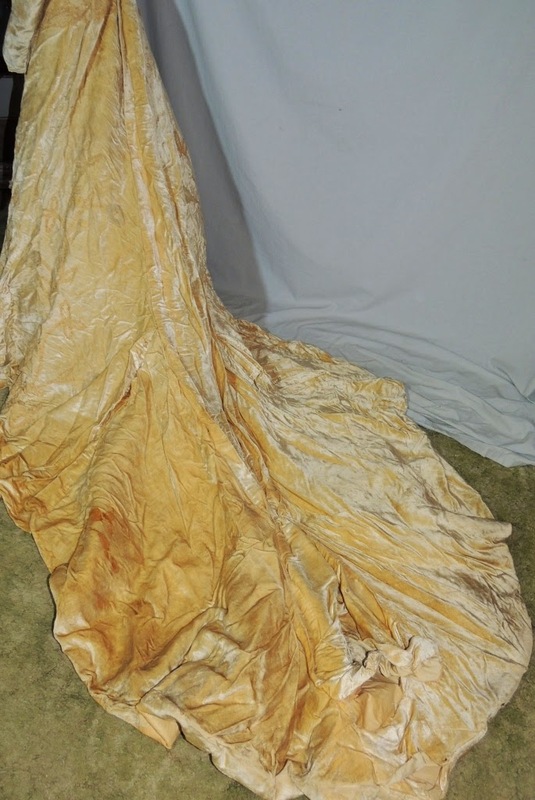 Inside is lined with cotton and it has bones in the seams. 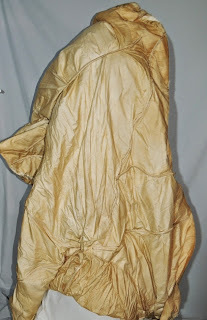 The center front lining is opened and there's pleated silk chiffon inserted in the seam. 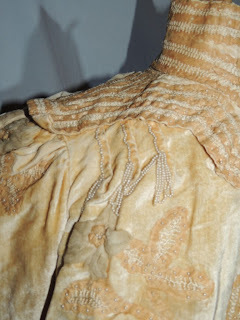 The back shoulder on the left has quite a few splits and on the right some mends, wear to the pile. 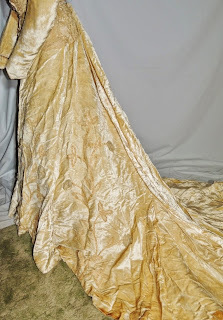 Scattered small tears in the velvet, silk chiffon backing the lace has tears, lace has a few minor breaks in the brides, silk seam binding around the bottom has some tears, minor wear to the pile in a few areas. The bodice measures 39 inches around the bust, across the back shoulder is 15 1/4, waist is 27 and shoulder to bottom front edge is 18 3/4 inches. The skirt is 25 inches around the waist,hips are full and it's 40 1/2 inches long in front. The velvet on the skirt is in better condition than the bodice, other than the one small area at the bottom of the train. 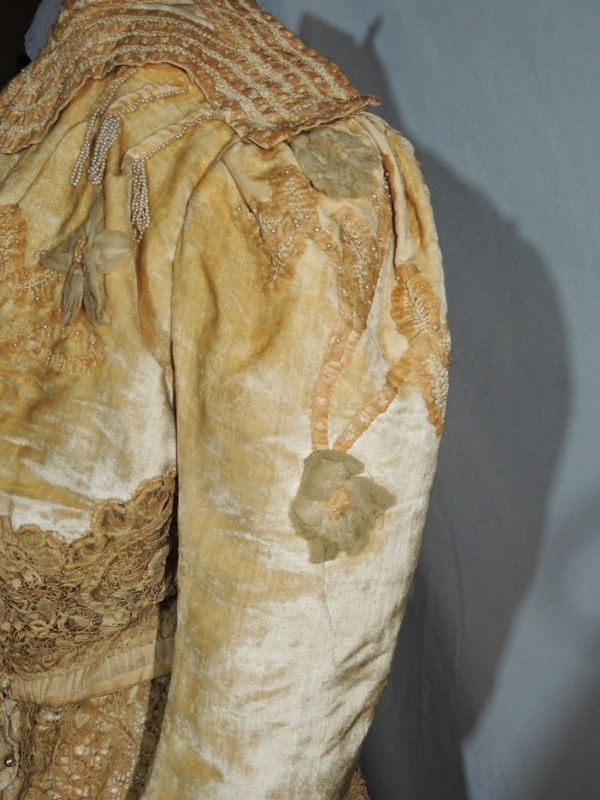 Silk flowers are dusty looking. 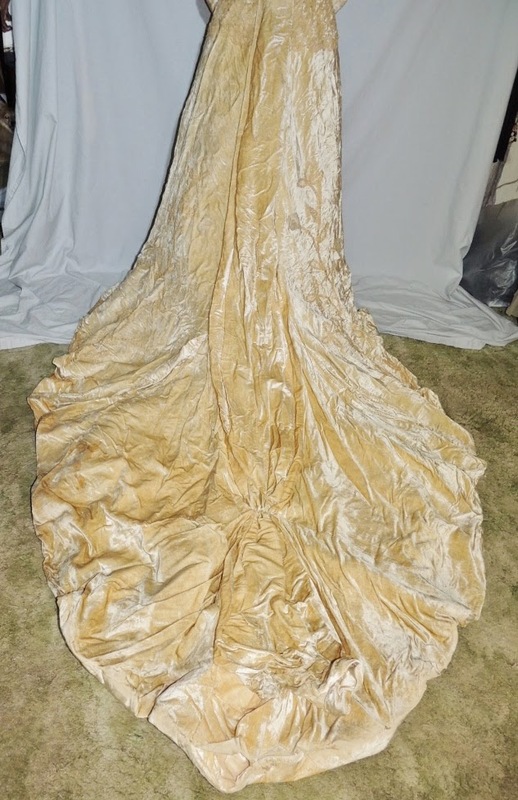 Fair to good condition, but sold as is. 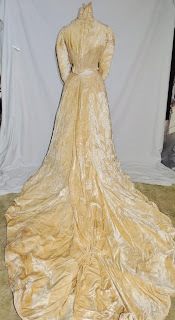 I don't want to say this is 100% a wedding gown but the color, the floral decorations, the overall look is very wedding-y. It is late 1890's. 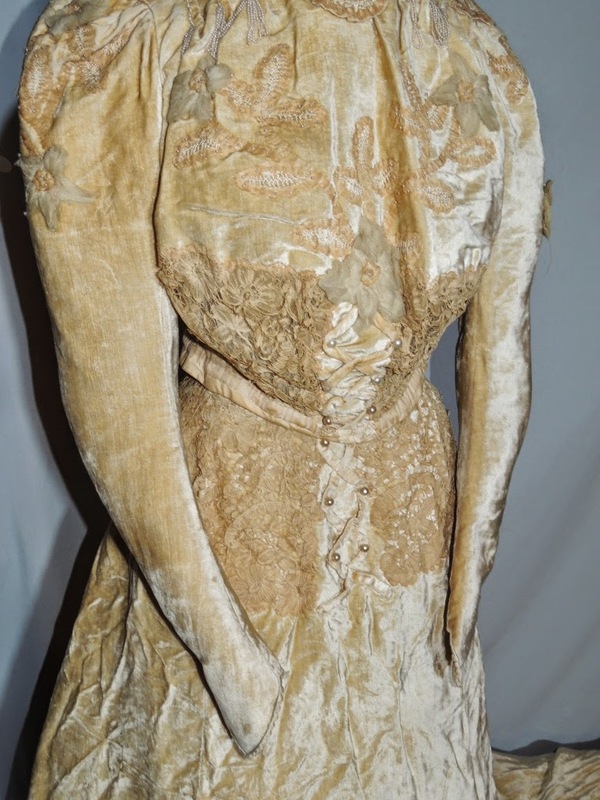 Pretty 1920's Dress with sleeves! 1920's Dress with Long Sleeves!